Maldives, officially the Republic of Maldives, is an island country and archipelago in the Indian Ocean. The Maldives lie southwest of India and Sri Lanka in the Laccadive Sea. The chain of twenty six atolls stretches from Ihavandhippolhu Atoll to the Addu Atoll. The capital and largest city is Malé, traditionally called the King's Island. The romantic holiday on the Maldives was a birthday present. The two of us were flying with Turkish Airlines through Istanbul, and the duration of our fantastic business class journey was around eight hours. Maldives consists of 1,192 coral islands grouped in a double chain of 26 atolls. We spent our holiday on two islands, a boat trip away from each other. The hotels we stayed at were the Holiday Inn Resort on the Kandooma island and the Kurumba Resort on the Kurumba island. During the first four days, we were staying on the Kandooma island, where we celebrated my birthday that started with a romantic breakfast on the beach and continued with a private boat trip to see dolphins, adorable creatures that can only be admired in daytime as they escape into the open ocean at night. We also went snorkelling, turtle watching and made a stop on an inhabited island, a strip of land in the ocean, which was truly romantic. 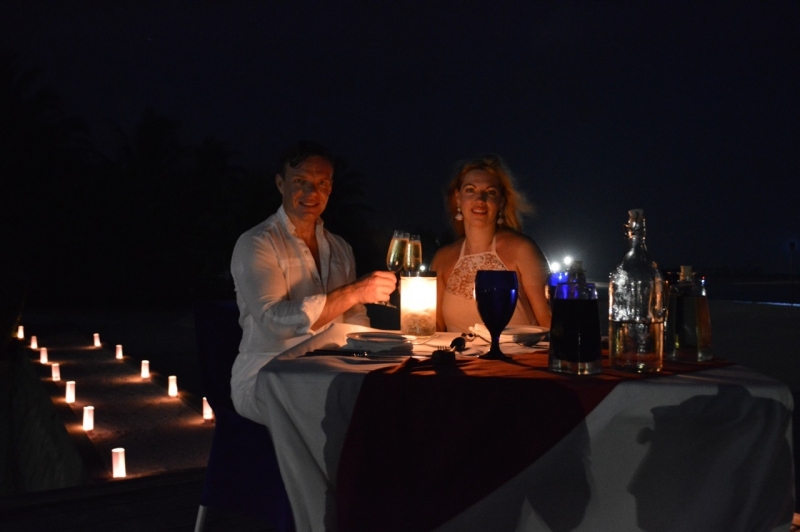 In the evening, I was surprised with a romantic dinner on the beach, halfway into the water. We had full attention of our own waiter and chef, and the dishes were cooked before our very eyes. The dinner was so romantic that the next day, we decided to have another one, but this time, the dinner was beautifully set in front of our hut, and my hubby ordered candles to be laid out in the shape of a heart around our table. Again, we were surrounded by our waiter's and chef's undivided attention. We also spent three days on the island of Kurumba, which is the oldest resort on the Maldives that accommodated its first visitors already 40 years ago! It should be mentioned that the airport is located just 10 minutes away. The island offers the opportunity of seeing corals and going snorkelling. We were also lucky enough to see a variety of colourful fish. The Kurumba island boasts seven restaurants offering different cuisine from around the world, and we were satisfied with all of them. I do realise now why the Maldives is such a hotspot among celebrities and newlyweds. First of all, the islands are very private and can be accessed only by means of private transport. Second, it's in the ocean, white sand, and endless romantic settings. By the way, on February 17, 2016, Paris Hilton also visited the Maldives to celebrate her birthday.